St. Mary's County Public Schools (SMCPS), in St. Mary's County, Maryland, serves 17,000 plus students from Pre-K through 12th grade. The district operates 19 elementary schools; four middle schools; three high schools; and eight administrative, educational, and training facilities. The SMCPS Division of Supporting Services, Department of Maintenance is responsible for maintaining all of the school district’s facilities and assets with 33 maintenance personnel. SMCPS wasn’t unusual. Many school districts adopted a maintenance strategy of simply fixing what broke as a means to work within budget restrictions. In July 2004, Sharon Dvorak, Work Order Specialist, was tasked with improving the way the Department of Maintenance handled the growing needs of the school system. As with all things in life—especially in a large organization—change can feel quite ominous. Sharon was aware of the “we’ve always done it this way” mindset. She needed to find the best way to introduce these changes for everyone. 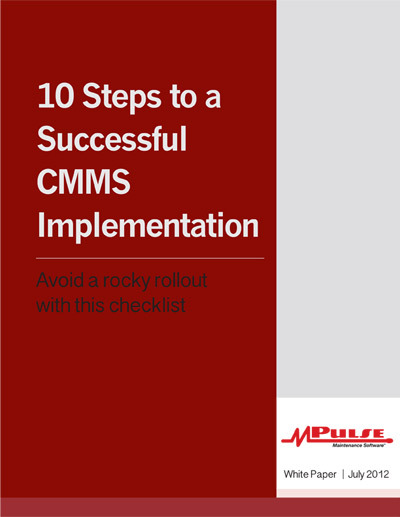 Sharon started using MPulse the same way most new CMMS users do—setting up the database with all the district’s building assets, employees, maintenance tasks, work order types, trades, and departments. In the autumn of 2004, with the basics in place, SMCPS began receiving and processing their first computergenerated work orders. But Sharon wasn’t just implementing maintenance software. She was introducing a completely new way to do business. Many of the SMCPS staff who were affected by these changes were not only unfamiliar with this type of process, they had never used a computer before. So Sharon personally trained each service requester (one primary and one secondary for each of the district’s facilities) who would use MPulse. Two people stand out the most in Sharon’s memories of this time period. “They were next to tears and visibly shaking at the thought of learning all of this… but they tried.” Sharon’s persistence with training paid off. By 2006, MPulse was widely accepted throughout the organization. Fast forward to August 2016, and Sharon hit a major milestone—surpassing 100,000 opened work orders. Typically, with the help of our maintenance work order system, she’ll process 75-100 work orders per day, close hundreds of completed work orders, generate PM schedules, and enter any associated costs. In addition, she continues to update and create records for assets and equipment that still need to be added to the system. To date, Sharon has created 2,477 scheduled maintenance tasks, which have resulted in 4,855 planned repairs or replacements. Reporting comes with the territory for public maintenance operations, and Sharon found data collection from MPulse helped a great deal. Using MPulse’s canned reports, Sharon captured individual facility cost, average work order time, and productivity data—all of which contributes to yearly budget projections and documentation for determining when it’s more cost effective to hire more maintenance personnel. MPulse CMMS software helps Sharon create reports for capital improvement projects as well as project planning and budget input. 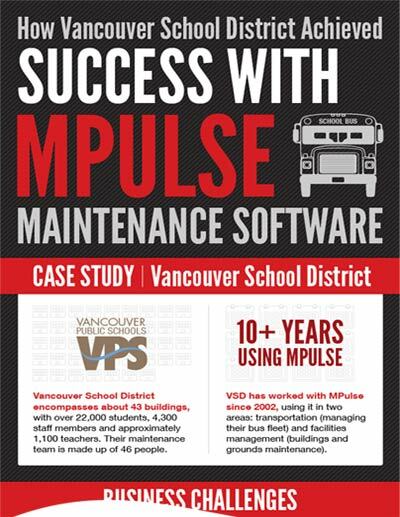 Sharon also uses MPulse data for her department’s annual Comprehensive Maintenance Plan. SMCPS uses MPulse’s asset tracking features for everything from boilers, HVAC systems, alarms, and backflow testing to grounds, painting, carpentry, and building renovations. To date, she has collected and imported 684 assets. “There’s always more to add, but we have a strong program in place, and it is working! Going forward, this information will become more valuable in determining the need for replacement vs. repairing,” she said. School maintenance isn’t about just taking care of buildings and equipment. Maintenance plays a huge role in the well-being of students, teachers, and administrators. When school districts like SMCPS use maintenance software to manage maintenance tasks, they are protecting the taxpayer’s investment in public education.